I posted some new batts to my etsy.com store tonight, here's a group photo that turned out quite nice. I didn't get far I have morels on the brain again!!! I have a lot of blues, reds, and yellows with green, not sure why they didn't get photographed tonight - but there is always tomorrow! 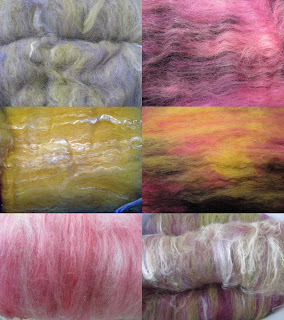 I hand dyed the fibers myself, the batts are a blend of merino, lincoln locks, some romney, silk bombyx, and angelina fibers. These will be wonderful for spinning or needle felting. I have an progress felted piece called Moss on my art blog, I needlefelted it with the Janome Expression and am now hand stitching the surface. Newer PostRain Rain Go Away!